INTRODUCTION: Surgical treatment of morbid obesity improves many co-morbidities including diabetes, hypertension, sleep apnea, and asthma. Elevated CRP levels, common in the morbidly obese, and its reflected increase in cardiovascular and cerebro-vascular complications has led to further study in patients undergoing laparoscopic Roux-en-Y gastric bypass (LRGB). 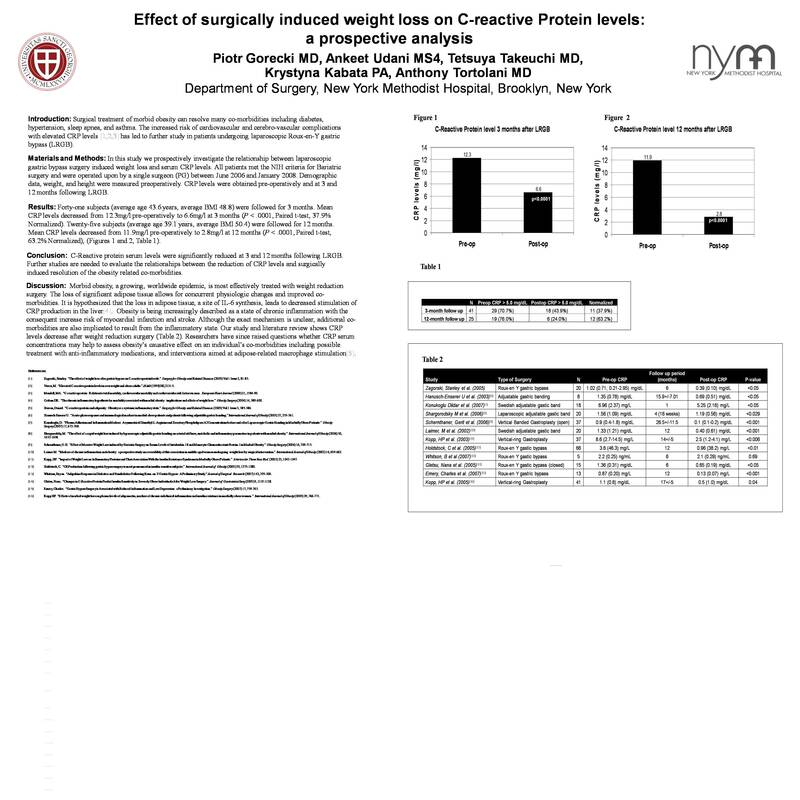 In this study we prospectively investigate the relationship between laparoscopic gastric bypass surgery induced weight loss and serum CRP levels. METHODS AND PROCEDURES: All patients met the NIH criteria for Bariatric surgery and were operated upon by a single surgeon (PG) between June 2006 and January 2008. Demographic data, weight, and height were measured preoperatively. CRP levels were obtained pre-operatively and at 3 and 12 months following LRGB. RESULTS: Forty-one subjects (average age 43.6 years, average BMI 48.8) were followed for 3 months. Mean CRP levels decreased from 12.3mg/l pre-operatively to 6.6mg/l at 3 months (P < .0001, Paired t-test, 37.9% Normalized). Twenty-five subjects (average age 39.1 years, average BMI 50.4) were followed for 12 months. Mean CRP levels decreased from 11.9mg/l pre-operatively to 2.8mg/l at 12 months (P < .0001, Paired t-test, 63.2% Normalized). CONCLUSION: C-Reactive protein serum levels were significantly reduced at 3 and 12 months following LRGB. The reduced pro-inflammatory state may play a significant role in the mechanism of resolving co-morbidities associated with morbid obesity.